High Quality Content by WIKIPEDIA articles! 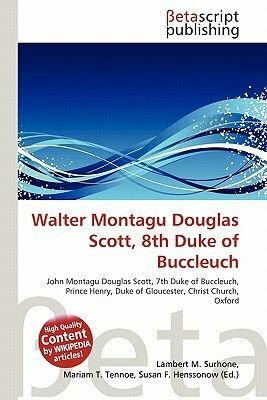 Walter John Montagu Douglas Scott, 8th Duke of Buccleuch, 10th Duke of Queensberry KT GCVO TD PC (30 December 1894 - 4 October 1973) was a politician and Conservative peer. He was the son of John Montagu Douglas Scott, 7th Duke of Buccleuch. His sister, Alice, married Prince Henry, Duke of Gloucester in 1935, becoming a member of the British Royal Family.Montagu Douglas Scott was educated at Eton and Christ Church, Oxford and had a military career commanding the 4th KOSBs. He was also Captain-General of the Royal Company of Archers.